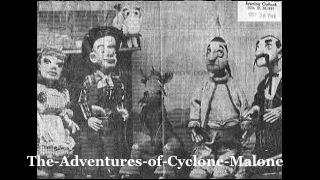 The Adventures of Cyclone Malone – western TV show. cues from Howdy Doody. Cyclone Malone is sheriff of Yahzoo Junction in Wishbone Hollow. Helping in the hunt for the bad guys is his teacher girlfriend Cozy Dumond, and the Indian chief and the talking animals who live with him. Starring Ross Jones as Cyclone Malone. This entry was posted in The Adventures of Cyclone Malone – western TV show, Western TV Shows Full Length and Free to Watch Online and tagged free, full length, online, The Adventures of Cyclone Malone, TV, western, Western Movie, western TV show, westerns. Bookmark the permalink.